This is your ticket to breath-taking Adventures in the Magic Kingdom! Join the exciting adventure as you search through the Magic Kingdom for the six silver keys that will unlock the Enchanted Castle. Use all your skills and resources to achieve your goal. *Grab a silver key from the ghoulish inhabitants of the Haunted Mansion. What other adventures await you in the Magic Kingdom? You'll just have to find out for yourself! 07-21-2017 shepard11 Box Text Disney Adventures In The Magic Kingdom This is your ticket to breath-taking Adventures in the Magic Kingdom! 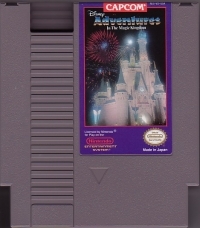 Join the exciting adventure as you search through the Magic Kingdom for the six silver keys that will unlock the Enchanted Castle. Use all your skills and resources to achieve your goal. 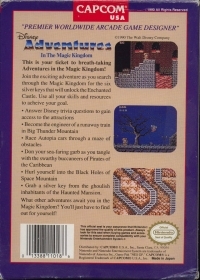 *Answer Disney trivia questions to gain access to the attractions *Become the engineer of a runaway train in Big Thunder Mountain *Race Autopia cars through a maze of obstacles *Don your sea-faring garb as your tangle with the swarthy buccaneers of Pirates of the Caribbean *Hurl yourself into the Black Holes of Space Mountain *Grab a silver key from the ghoulish inhabitants of the Haunted Mansion. What other adventures await you in the Magic Kingdom? You'll just have to find out for yourself! 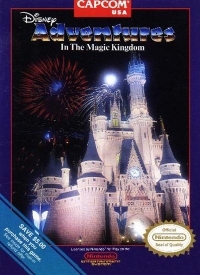 This is a list of VGCollect users who have Disney Adventures in The Magic Kingdom in their Collection. This is a list of VGCollect users who have Disney Adventures in The Magic Kingdom in their Sell List. This is a list of VGCollect users who have Disney Adventures in The Magic Kingdom in their Wish List.